Choclate Fuge recipe by Ravina at PakiRecipes.com. Butter an 8-by-8-inch straight-sided baking pan. Line with parchment paper; set aside. Butter a large, shallow, stainless-steel bowl; set aside. In a 3-quart saucepan, whisk to combine the sugar, cocoa, and salt . Place over medium-low heat, and add corn syrup and milk, stirring until smooth. Add chocolate. Cook, stirring, until chocolate is melted and sugar dissolved before it reaches a boil. Brush down sides of saucepan with a pastry brush dipped in water to prevent crystallization. Increase the heat to high, and cook until it reaches 236 degrees (soft-ball stage). Pour into prepared bowl without scraping the sides of the saucepan. Dot top with butter. Let cool to 110 degrees to 118 degrees for about 1 hour. Add vanilla. Using a plastic dough scraper, transfer to the bowl of an electric mixer. Beat on low speed until the butter and vanilla are completely incorporated. 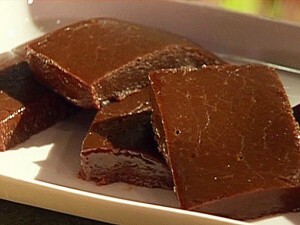 Increase speed to medium, and beat, stopping occasionally, until fudge keeps its shape when dropped from a spoon and sheen is gone, 3 to 8 minutes. Using a clean plastic dough scraper, transfer to prepared baking pan, spreading evenly. Before fudge sets completely, score with a knife into 1-inch squares. Let stand until completely cooled. Store in an airtight container in a cool, dry place for up to 2 weeks.